Dinosaurs 1 and 2 are well. 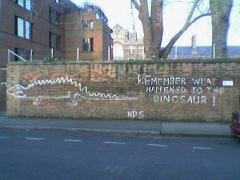 Dinosaur 1 has had his head touched up, I suspect, where it is on what may possibly be a new bit of wall. 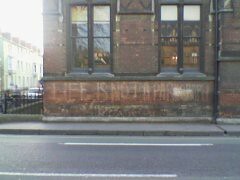 Well, I say new, I suspect it was done at the time of the new Keble red brick block which could well be about 10 years old now. 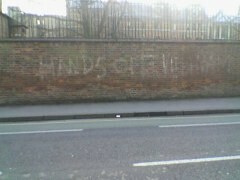 The Vietnam one says 'hands off Vietnam' and is on the wall of Keble on Parks Road. 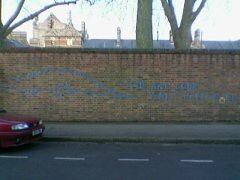 Near to it is 'life is not a paragraph', which I don't think of as being a classic Oxford graffito, as the others have all been there as long as I can remember, whereas I am pretty sure this has been there a while, but not (ahem) 22 or so years. It is an e. e. cummings quotation apparently. 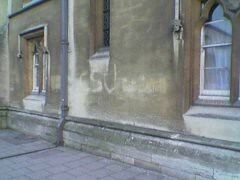 'CSU now' is pretty faint, but can be made out on the wall of Exeter College to the left of the Blackwells art and poster shop on Broad Street.